Background PRIMO is a dose verification system based on the general-purpose Monte Carlo radiation transport code penelope, which implements an accurate physics model of the interaction cross sections and the radiation transport process but with low computational efficiency as compared with fast Monte Carlo codes. One of these fast Monte Carlo codes is the Dose Planning Method (DPM). The purpose of this work is to describe the adaptation of DPM as an alternative PRIMO computation engine, to validate its performance against penelope and to validate it for some specific cases. Methods DPM was parallelized and modified to perform radiation transport in quadric geometries, which are used to describe linacs, thus allowing the simulation of dynamic treatments. To benchmark the new code versus penelope, both in terms of accuracy of results and simulation time, several tests were performed, namely, irradiation of a multi-layer phantom, irradiation of a water phantom using a collimating pattern defined by the multileaf collimator (MLC), and four clinical cases. The gamma index, with passing criteria of 1 mm/1%, was used to compare the absorbed dose distributions. Clinical cases were compared using a 3-D gamma analysis. Results The percentage of voxels passing the gamma criteria always exceeded 99% for the phantom cases, with the exception of the transport through air, for which dose differences between DPM and penelope were as large as 24%. The corresponding percentage for the clinical cases was larger than 99%. The speedup factor between DPM and penelope ranged from 2.5 ×, for the simulation of the radiation transport through a MLC and the subsequent dose estimation in a water phantom, up to 11.8 × for a lung treatment. A further increase of the computational speed, up to 25 ×, can be obtained in the clinical cases when a voxel size of (2.5 mm)3 is used. 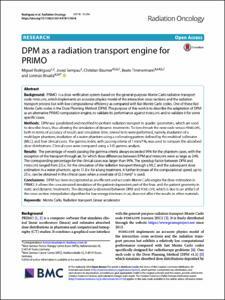 Conclusions DPM has been incorporated as an efficient and accurate Monte Carlo engine for dose estimation in PRIMO. It allows the concatenated simulation of the patient-dependent part of the linac and the patient geometry in static and dynamic treatments. The discrepancy observed between DPM and penelope, which is due to an artifact of the cross section interpolation algorithm for low energy electrons in air, does not affect the results in other materials. Rodríguez, M.; Sempau, J.; Bäumer, C. DPM as a radiation transport engine for PRIMO. "Radiation oncology", 27 Desembre 2018, vol. 13, núm. 1, p. 256 (1)-256 (9).